Split Corona Daffodils are quite unusual. The cup is cut to over one-half its length into segments that overlay the petals instead of forming the typical trympet. The flowers often look more like a hibiscus than a daffodil. Also known as "Butterfly Narcissus." Orangery is a Split Corona Daffodil with a creamy white perianth and light tangerine colored centers. 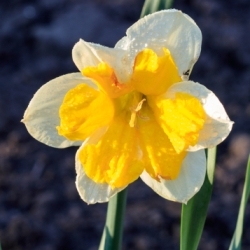 With its flattened cup against the white petals it looks almost like a double daffodil. Partial shade may produce a darker color. 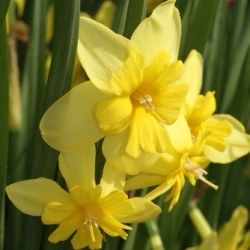 Tripartite is a split-corona daffodil with 2-3 golden-yellow flowers per stem. The corona segments lie flat against the perianths. Sweetly scented.